Whether your children are younger or in their teens, the Family Link app lets you set digital ground rules to help guide them as they learn, play, and explore online. For children under 13 (or the applicable age of consent in your country), Family Link also lets you create a Google Account for your child that's like your account, with access to most Google services. You can: Guide them to good content • View their activity - Not all screen time is the same. Help your child make healthy decisions about what they do on their Android device, with activity reports showing how much time they’re spending on their favorite apps. • Manage their apps - Handy notifications let you approve or block apps your child wants to download from the Google Play Store. You can also manage in-app purchases, and hide specific apps on their device. • Feed their curiosity - It can be hard to figure out what apps are right for your child, so Family Link shows you teacher-recommended apps on Android that you can add directly to their device. Keep an eye on screen time • Set limits - It’s up to you to decide the right amount of screen time for your child. 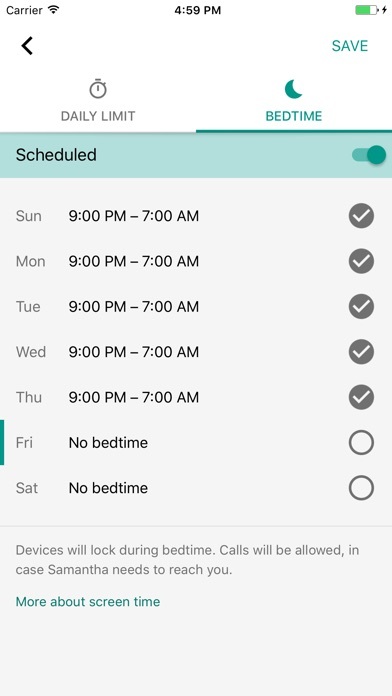 Family Link lets you set time limits and a bedtime for their supervised devices, so you can help them find a good balance. 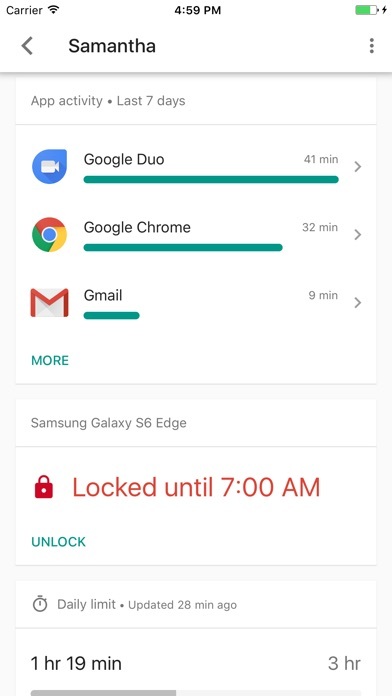 • Lock their device - Whether it’s time to go play outside, have dinner, or just spend time together, you can remotely lock a supervised device whenever it’s time to take a break. See where they are • It’s helpful to be able to find your child when they’re on the go. You can use Family Link to help locate them as long as they’re carrying their Android devices. Important Information • Family Link’s tools vary depending on your child’s device. See a list of compatible devices at families.google.com/familylink/setup • While Family Link helps you manage your child's purchases and downloads from Google Play, they will not need approval to install app updates (including updates that expand permissions), apps you have previously approved, or apps that have been shared in Family Library. Parents should regularly review their child’s installed apps and app permissions in Family Link. • You should carefully review the apps on your child’s supervised device and disable those you don’t want them to use. Note that you may not be able to disable some pre-installed apps. • To see the location of your child or teen’s device, it must be powered on, recently active, and connected to the internet. • Teacher-recommended apps are only available on Android devices in the US to parents of children of certain ages. This is what I get when I get to the final steps of getting it set up. Anything I do it wants me to install “Family Link Manager”. Family Link is already installed. I click “Next” and it shows a status bar for downloading, it gets to 98%, the screen goes black, then I’m back on the home screen. I go straight to the Family Link app and it tells me “Can’t Connect to Family Link”. I can remove child or reconnect. I choose “Reconnect” and it’s back to saying I need to install “Family Link Manager”. I’m sure it’s because it’s an old tablet, running version 5.1.1 (no software updates available). The information on the Help Center says, “Devices running Android 5.0 or 6.0 (Lollipop or Marshmallow) may also be able to run Family Link.” Don’t take me through the whole process to only find out in the final steps that it’s not going to work. It recognized what version I was running, but said my only issues will be some limitations. That would have been a good time to tell me stop wasting my time, that I can’t do it. We’re not going to buy our 12 year old a new tablet. We will just have to monitor her the “old fashioned” way and when we can we’ll get an iPad instead. I actually really like this app only downside is that my preteen can’t get on regular YouTube and YouTube kids gets boring for her. Does not work for a child with an iPhone! Love the app but it does not work for a child with an iPhone. Please fix this! Super frustrating. 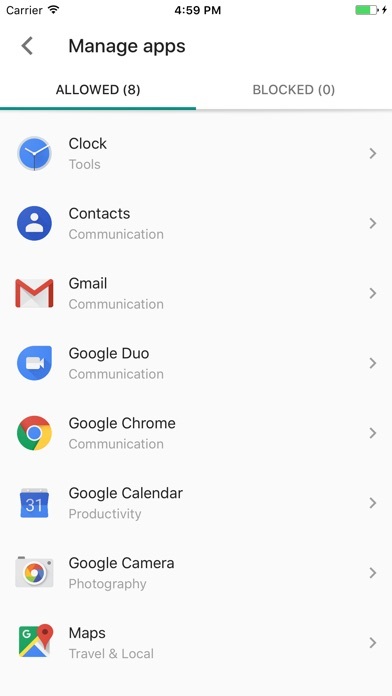 Can not log in to Hangouts on iOS device with the google family link child account. Now my only option is to lose (or not use) the email address that we chose for our child (which is hard to find one that is not already taken) and create another one. Disappointed and lost quite a bit of time trying to solve this to no avail. Two thumbs down. This app stinks. Somehow, our kid found a way to install Snapchat when we do not allow permission. Google family sends a notification that she installed it. No clear explanation available online as to how this is occurring. Thanks for nothing. 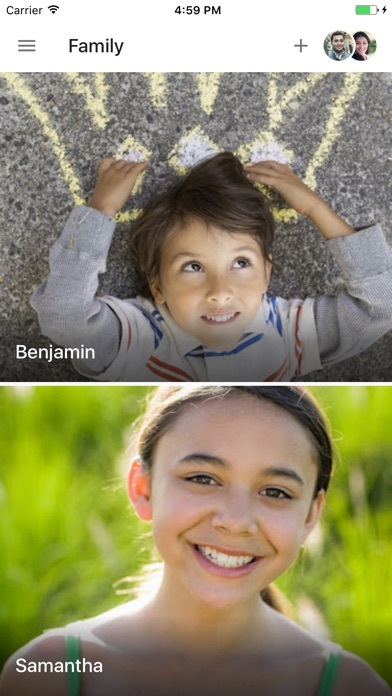 Don’t expect your kids to be able to call grandma and grandpa on hangouts. I’ve been horribly unsuccessful at being able to actually approve my child’s use of any apps on their iPad. Every time we try it just says account can’t be added. This app gives no real management control over any of these permissions. I spent over 30 minutes on the phone with tech support and there support boiled down to, buy an android device for your child and it will work then. Does this app cost money$$...? I downloaded and after it said “ Thank you for you purchase! “. So does it?